There are a vast range of diseases and disorders that are neurocristopathic in origin, including Hirschsprung’s disease, pheochromocytoma, familial dysautonomia, craniofacial disorders, and melanomas. Having a source of human neural crest cells is highly valuable for investigating potential treatments for such diseases. 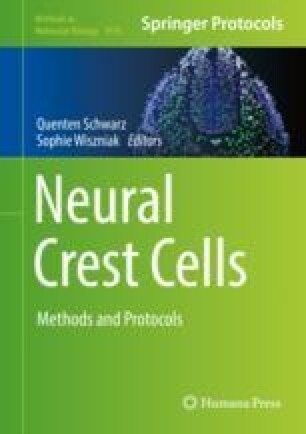 This chapter describes a robust and well-characterized protocol for deriving neural crest from human pluripotent stem cells (hPSCs), which can then be differentiated to neuronal and non-neuronal lineages. The protocol is adapted to suit hPSC maintenance as a monolayer bulk culture or as manual-passaged colonies, which makes it widely applicable to researchers that may use different systems for hPSC maintenance. Kwaku Dad Abu-Bonsrah and Serena Viventi contributed equally to this chapter.